Using the beautiful Ascended Masters Oracle Cards Deck by Doreen Virtue the message for the week tells us to not only use our physical strength and actions but to honor our heart’s desires and passions and take time to go within and be peaceful with all that we are focusing on. 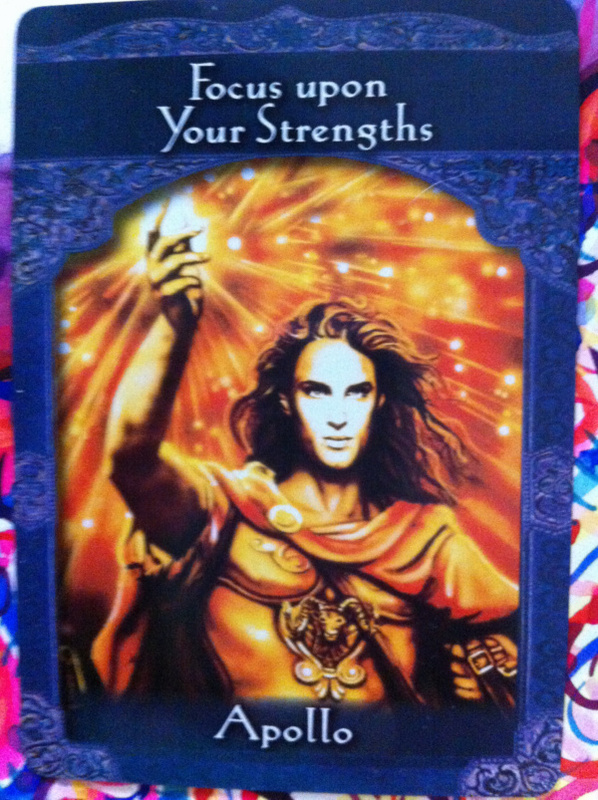 This card reminds you to focus upon your strengths and not upon any perceived weaknesses. Our strengths could include your loving heart, pure intentions, people skills, hobbies, or something that you excel in. Even if your talents still need polishing, these are strengths and assets. The more you bless and appreciate your strengths, the stronger they’ll grow. If you focus upon so called weaknesses they will grow. 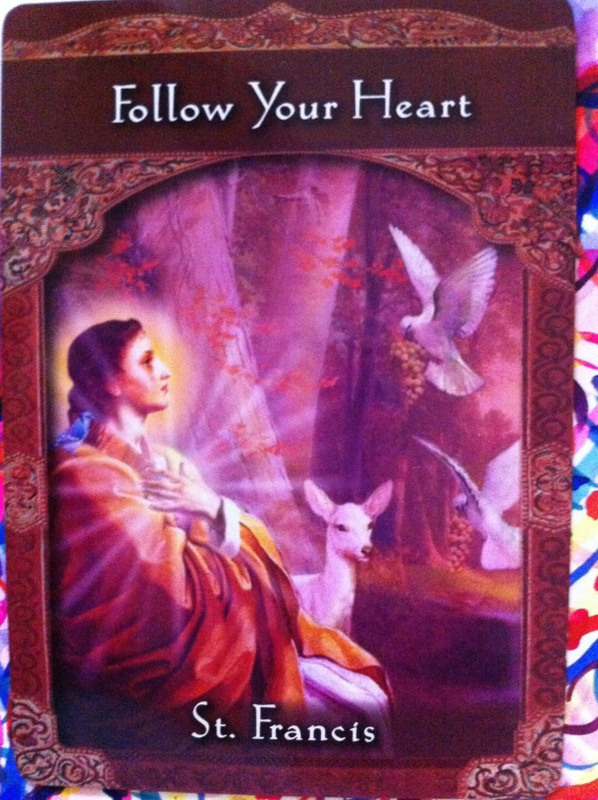 This card comes to you as a reminder of the importance of viewing yourself with compassion and love. Anytime you find yourself thinking or feeling poorly about yourself, focus upon your strengths instead. Also, use daily positive affirmations to lift your energy and faith. Speak of yourself in positive terms. Begin an exercise program to build and tone your muscles. This is a message of love or healing about a brother or brotherly figure. With your exercise, healthful eating increase your motivation. There also can be a happy endings to a stressful situation. Apollo is the Greek sun god who’s the son of Zeus and the twin brother of the goddess Artemis. Apollo is a powerful deity who can bring out the sunshine in your life. He is renowned for his physical strength. Apollo can act as a personal trainer to motivate your exercise program, gain emotional and intellectual strength. St. Francis of Assisi was born to a wealthy Italian cloth merchant, but he later renounced his inheritance to follow an ascetic spiritual path. As he volunteered in hospitals and ministered to the sick, he gained followers who eventually became the Franciscans. Many legends speak of St. Francis’s ability to communicate with animals, and today he is the patron saint of the environment and animals. Call upon St. Francis for help in situations where your family or friends don’t understand your choices or spiritual path, or any issue involving animals. And it’s in dying (to ourselves) that we’re born to eternal life. 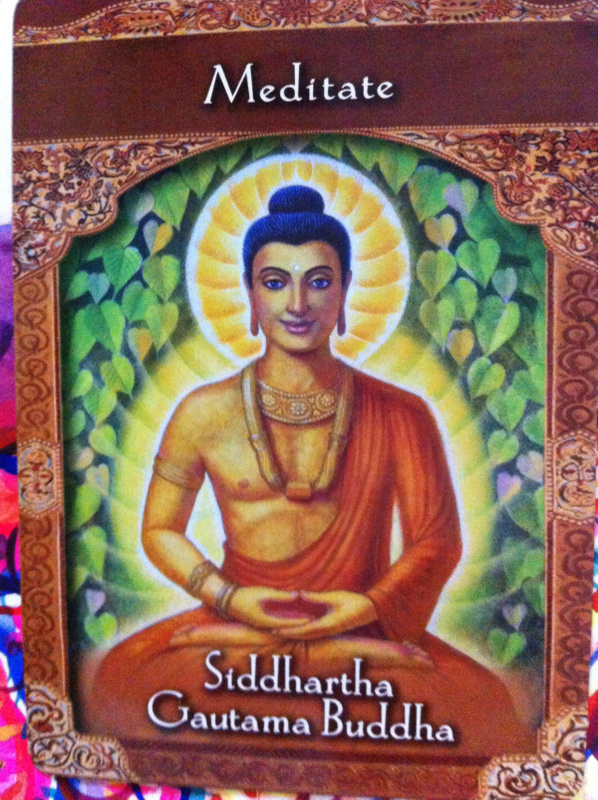 This card is a call for you to meditate regularly. Your path, body, and soul are asking for quiet time to reflect, think, and receive insights. Even a small amount of time devoted to daily meditation will bring you great gifts. You don’t necessarily need any formal training in meditation. It’s simply a matter of sitting quietly, closing your eyes, breathing, and listening. Also, be still and listen. You need some alone time. Be honest with yourself. Join a meditation group or take a meditation class. Listen to a meditation CD. Balance and moderation in all things. Joy. Siddhartha Gautama devoted his life to finding an end to suffering. He renounced his family’s wealth and tried several spiritual paths, including asceticism, in his quest for spiritual growth. He finally had insight that moderation (or “the middle way”) was the path to enlightenment. He also demonstrated the benefits and importance of meditations, and many of his insights occurred as he meditated beneath the Bodhi tree. Call upon Siddhartha Gautama for help in developing your meditation practice, to practice moderation, and to overcome any form of suffering.